LIMA, Feb 8 2012 (IPS) - Indigenous communities in Peru have a long list of comments and objections to the proposed regulations for the law governing prior consultation on initiatives affecting their territories. This criticism was voiced in a series of workshops conducted across the country ahead of the national meeting on the issue scheduled for Feb. 13-15. “Before the regulations can be adopted, the law needs to be amended to resolve several gaps, such as the absence of the minimum requirements for prior consultation rights established by international instruments,” Alberto Pizango, head of the Inter- Ethnical Association for the Development of the Peruvian Rainforest (AIDESEP), said. Pizango – who became widely known during his presidential bid in 2011 – met in Lima on Feb. 2 and 3 with some 20 indigenous leaders from the Amazon region to agree on a joint position on the draft regulations, which will be delivered to the Ollanta Humala administration at the national event later this month. Along with another four organisations that participate in the multi- sector committee created to prepare a draft regulations for the law, AIDESEP objects to public consultations being held at the environmental impact study stage of a development project, after the state has granted the relevant concession. “For years the government failed to implement the provisions of Convention 169 and now it wants to continue ignoring them with inadequate regulations,” Pizango told IPS, in reference to the Convention concerning Indigenous and Tribal Peoples in Independent Countries adopted by the International Labour Organisation (ILO) in 1989 and ratified by Peru in 1994. Pursuant to ILO Convention 169, which came into effect in 1991, ratifying governments must implement special systems to protect the rights of their native peoples and introduce a mechanism to consult them on laws, production projects, and policies that may affect their development and their habitat. Despite ratifying the convention more than 15 years ago, Peru had done nothing to apply its provisions and, in particular, article 6, which expressly establishes the right of indigenous peoples to be consulted on matters affecting their territories and way of life. It was only in 2011 that Congress finally passed the Indigenous and Native Peoples’ Right to Prior Consultation Act. According to observers, this step was prompted by a bloody clash two years earlier between the police and indigenous groups protesting for their right to be consulted in the northern rainforest town of Bagua, which culminated on Jun. 5, 2009 with more than 30 people dead between policemen and protesters. Indigenous leaders also demand that the state include the obligation to obtain express consent or acceptance from indigenous peoples before launching any development projects in their territories that may affect their fundamental rights. Moreover, they ask that the state refrain from waiving consultation even when the affected communities have begun negotiations with the concessionary company. For native leaders, a consultation guarantees a more transparent process. In addition, some leaders claim “there are some indigenous grassroots organisations” that were not invited to the workshops to discuss the regulations, and, thus, such forums should be held in more areas. 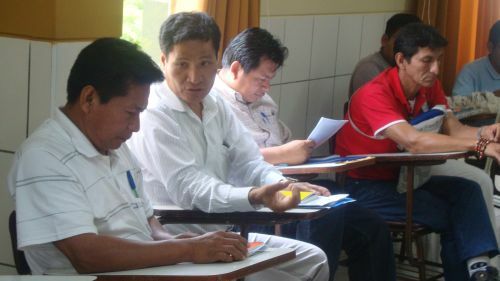 So far workshops have been held in Bagua, the northern cities of Chiclayo and Iquitos, and the central cities of Cuzco and Pucallpa. The sixth workshop, held in Huancayo, in the central Andean region of Junín, ended on Feb. 6, with the series of workshops closing in Lima. In response to this complaint, Vice Minister of Intercultural Matters Iván Lanegra told IPS that it was the indigenous organisations involved in the multi-sector committee that chose the cities in which the workshops would be held, and they are also responsible for convening participants and defining the methodology for the meetings. “Everything was decided with their agreement. It’s an unprecedented system because until now the state decided unilaterally how things would be done,” he said. He went on to say that after the meeting in Lima the multi-sector committee will sit down with indigenous leaders to discuss possible improvements to the regulations. The regulations are expected to be adopted by the end of the month, at which time a database of indigenous peoples will also be operational to help identify the groups that need to be consulted for each project or initiative. “The database will have an open-ended design and will be improved through the interaction with indigenous groups,” the government official said, after noting that the software will enable any citizen to freely access the database. More than six million of the country’s 30 million people belong to one of 51 ethnic communities, according to 2007 data from the National Statistics Institute. Also 1,786 native communities and over 6,000 peasant communities are recognised. The National Confederation of Communities Affected by Mining (CONACAMI) and other organisations demand that organised rural groups known as “rondas campesinas” and local communities living near water basins be consulted as well, as their livelihoods depend on the water that is usually used for extraction activities. “Consulting them has to be a government obligation,” CONACAMI president Magdiel Carrión told IPS. But Lanegra argues that under Convention 169 that right only applies to indigenous peoples, although the government does observe other rights for these groups, such as the right to participate. However, expectations among these rural groups continue to grow. Rural leaders in the southern region of Puno, who oppose the construction of the Inambari hydroelectric dam, demand to be taken into account. Legislator Eduardo Nayap, a representative of the Awajun people, told IPS in turn that the important thing is that the dialogue not be hindered and that criticism be focused on improving the regulations and not on amending the law. “We’ve struggled hard for this, and we need to move forward. We’ve already taken a major step,” he said.